Kuala Lumpur, 2 November 2018 – Licensed by SANRIO, organised by ALATA EVENTS and MACEXPO, supported by TOURISM MALAYSIA, Hello Kitty and her friends are now in Malaysia for Our Sanrio Times – Kuala Lumpur at Hall 5, Level 5, Quill City Mall Kuala Lumpur! Due to popular demand and overwhelming response from the public, the organisers are extending the exhibition to 17 February 2019! It is the perfect place to celebrate the holidays that fall between the exhibition period, including Christmas, New Year and Lunar New Year. The exhibition opens daily from 11am to 9pm. Get your tickets online at www.ticketcharge.com.my or at the event hall. Tickets purchased earlier will now have their validity extended until February 17, 2019. There is a special promotion in conjunction with the festive season – buy 4 tickets to the exhibition and you will be entitled to receive a RM5 Pop-up Store Cash Voucher and 2 pieces of exclusive Sanrio character cookie sticks for FREE! 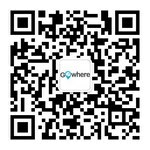 The promotion period is from 21 December 2018 to 1 January 2019. Get your hands on the limited edition ‘Nerdunit byyou’ Custom T-Shirts only at the exhibition. You can customise your own name and favourite numbers covered in Sanrio characters! While you are at it, become the Best Pair in ‘Nerdunit byyou’ Couple T-Shirt Photo Contest. Take a picture of you and your other half and post it on your personal Facebook page, tag 3 friends and send the link through email to sale@oursanriotimes.my on or before 24 February 2019, 6pm. Five (5) couples will be selected and notified by early March of 2019. Our Sanrio Times is the largest exhibition of its kind in Malaysia and Southeast Asia. At 1,500 sqm large, the exhibition features 13 Sanrio-themed zones where visitors can view and take photos of the 100 out of 400 adorable Sanrio characters in a variety of colourful settings, offering a visual experience like never before. The exhibition is not just the place to bring your little ones this holiday, but also the place where you get to relive your memories while capturing new ones. 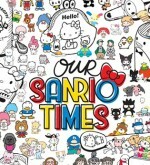 There are 4 key highlights in ‘Our Sanrio Times’. First, the most delighting part is ‘Sanrio Village” whereby 100 selected characters will team up at the exhibition in Kuala Lumpur for the first time. Some characters will take a ride on the Sanrio train which is made to imitate Sanrio Gift Gate of Gotanda, Tokyo in 1970s. Second, the replica of the first merchandise created by Sanrio, Hello Kitty coin purse, will be first shown in Malaysia. All loyal fans will definitely be surprised with it! Third, with the full support of Sanrio Japan and Sanrio Hong Kong, over 300 vintage items will be displayed offering unprecedented visual experience. Last but not least, designers in charge of Sanrio Japan is especially invited to create exclusive hand sketch for 9 well-known Sanrio characters, teaching us how to draw the lovely Sanrio characters step by step. This drawing tutorial will undoubtedly become a great platform for fans to create their beloved characters! In addition to the 4 highlights above, the giant and adorable Hello Kitty plush in 3.5 m tall, is going to have her first encounter with fans! Apart from that, the exhibition includes various theme zones. For example, ‘Sanrio Time Tunnel’ leads us to have a quick review on all Sanrio classic characters over the past decades; ‘Paper Doll Fun’ recalls our childhood memory of ‘doll dressing up game’; ‘Vintage Stationery House” displays the Sanrio classic stationery; “Strawberry Newsroom” let all super fans read through the previous issues of Strawberry News which is a monthly magazine sharing Sanrio updates; “Strawberry Office” where you may find many secret of Strawberry King. Sanrio fans could even have a delighting experience of being the cover idol in ‘Strawberry Studio’! Last but not least, it is a precious time for Sanrio character to visit Malaysia. Don’t miss the chance to travel with them in ‘Malaysia Zone’ to commemorate this perfect and enjoyable journey! For the details of exhibition zones, please refer to Appendix 1. 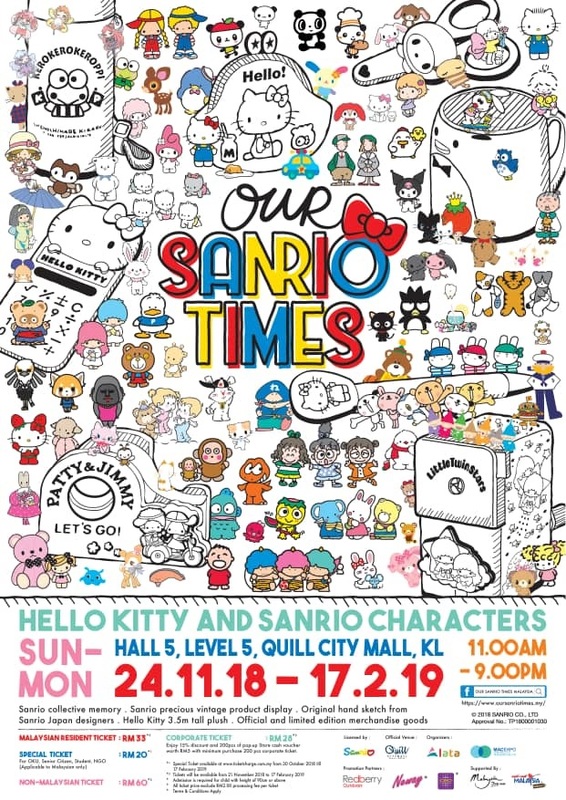 Our Sanrio Times Kuala Lumpur Exhibition is licensed by SANRIO, organised by ALATA EVENTS and MACEXPO, with QUILL CITY MALL KUALA LUMPUR as the Official Venue, REDBERRY MEDIA GROUP and NEWAY & CEO KARAOKE BOX as Promotion Partners. Tickets are available through www.ticketcharge.com.my or call the hotline +603 9222 8811. For more info, log on to www.oursanriotimes.my or our sanrio times Malaysia or Instagram oursanriotimes.malaysia.